View More In Table Runners - Page 2. QueenDream wedding and Children room decoration products. The beautiful handmade tutu table skirt will make your party decoration a showpiece that is unforgettable, fun yet classic and elegant! We aim at providing our customer the best quality products and the best shopping experience. The tulle tablecloth is made of High-intensity Nylon yarn Tulle + Chiffon lining. Wrinkle free and with threaded Phnom Penh ribbon,looks more elegant and beautiful. CREATIVE & EYE CATCHING TO MAKE YOUR EVENT SPECIAL - our table skit combines pretty theme colors with fluffy tutu, which is every kid's favorite and love. You can put lights behind the table skirt or run through it to make it even more MAGIC! EASY SET UP - included velcro makes it easy for you to attach the table skirt to any surface. 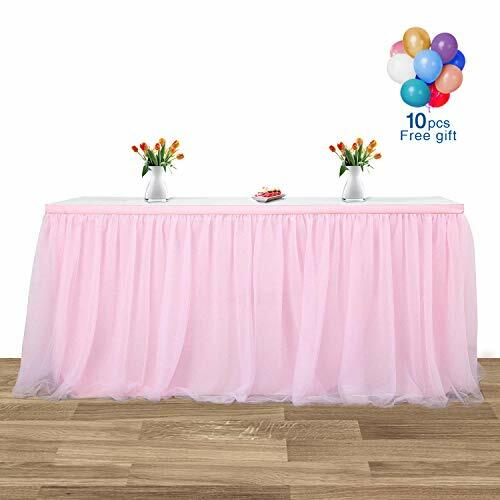 VERSATILE IN MANY APPLICATION - this tutu table skirt can be used for princess party decoration, baby shower, girl's birthday party, wedding, holiday deco, room decoration, or even fun to wear and play around with! MEASUREMENT TABLE SKIRT: 3yard (9 ft) long x 30" high. *Notice: This Listing picture is Effect Picture, Please measure your table length to determine sizes needed. We recommend to cover the front and sides of the table. SPECIAL MATERIAL: The tulle tablecloth is made of High-intensity Nylon yarn Tulle + Chiffon lining. Wrinkle free and with threaded Phnom Penh ribbon, looks more elegant and beautiful. EASY SET UP: Including velcro makes it easy to fixed tulle rectangle table skirt. The velcro has hook side,the hook side should stick to the edge of the tulle table skirt,then rip off the film of the glue side to stick to the edge of the table.That would be very sturdy. SUIT FOR MANY OCCASION : It¡¯s eye catching party center piece, suit for baby shower,slumber party, Birthday parity, baby shower, slumber party, wedding, party, ,home deco. CREATIVE & EYE CATCHING CENTERPIECE: The table skirt provide hidden storage underneath. You can put lights behind the tulle tablecloth or run through it to make it even more magic.This tutu table skirt will make your party elegant and unforgettable.